Santorini on a budget, YES IT’S POSSIBLE! After a wonderful weekend spent in Athens and getting a chance to take in the Greek culture and hospitality, it was time to take a trip to the place in which I’d heard so many amazing things about. I mean how could I not?! Looking at a map and seeing just how close I was and not going would have led me regretting it down the line. Anyone who knows me knows that I like to live my life with no regrets and I don’t like to take no for an answer. I found a cheap flight on Skyscanner and went on Booking.com to get accommodation, and just like that I was on my way! 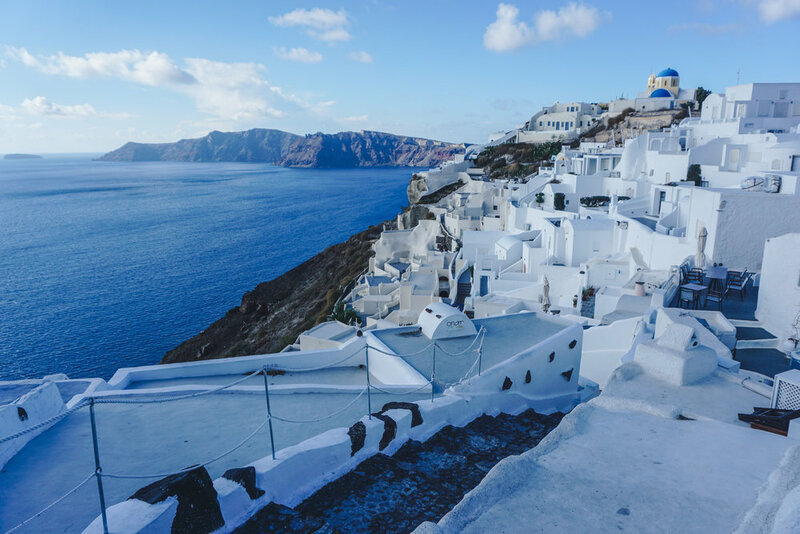 Whether you're looking for the picture-perfect honeymoon destination, a relaxing weekend, or simply a check on your bucket list, Santorini is for you! What brought me here were all the Instagram photos of what looks like one of the most beautiful places on earth, the mountainside hotels with your own hot tub and pool in your room. While all of these still remain good reasons to visit, you'd be wrong in thinking that is all Santorini has to offer. 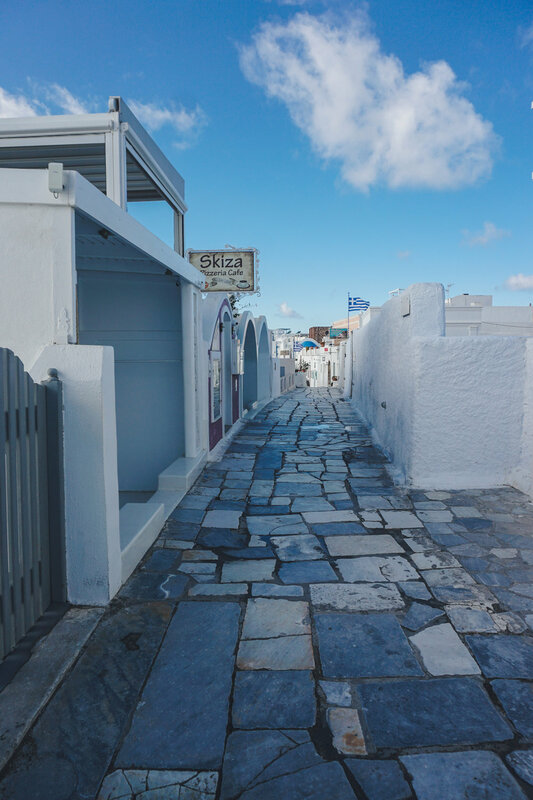 If done properly and with a little planning, you can enjoy the side of this island that I did: cheap, off the beaten path, and more action-filled than just staying in your villa in Thira! 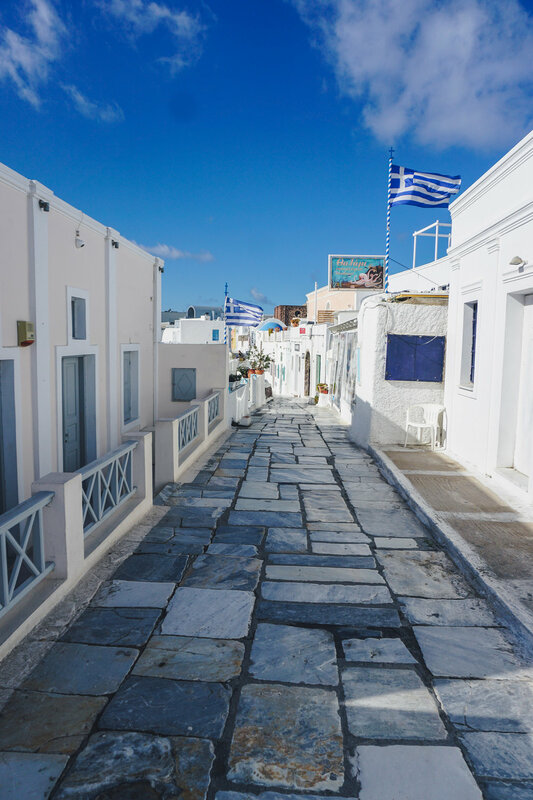 Instagram really did work it’s magic and wonders with this Aegean Sea paradise and it’s all white facades with sparkling blue rooftops. It drew in hundreds of thousands of travelers in an instance after going viral, and to many, through pictures, they thought it’d be completely and utterly out of their price range. Whether Instagram is your lifeline or it’s Facebook, Santorini will give you plenty of opportunities to turn your negatives into a positive where you can ultimately make everything alright. If you’ve done some thorough research on Santorini ahead of time, you’d know that it’s possible to get to the island one of two ways. First by plane ( the comfortable and quick way) and the second by ferry (also comfortable but 6x-8x longer than a flight). Depending on the time of year you’ll be traveling the suggestion of which to take may vary quite a bit as prices tend to shift in favor of the ferry a bit more. However, traveling in off-season you’ll find it much cheaper and convenient to take a flight as it only takes 45 minutes to an hour and they’re the same price. Flight - Booking during Peak season should always be done ahead of time regardless of the fact that they offer 10-15 flights per day. Buying a round trip will run you about $105 when booked in advance during high-season, and about $85 roundtrip if booked 2 weeks or more in advance during low-season. Ferry - When making the decision on which ferry to take use FerryHopper. This is by far the most efficient and simple way of booking your ticket to guarantee the best prices and yourself a seat on the ferry. Like stated before unless you’re really just trying to experience the travel over water for 8 hours, we’d suggest taking the easy flight for comfort and for saving money. 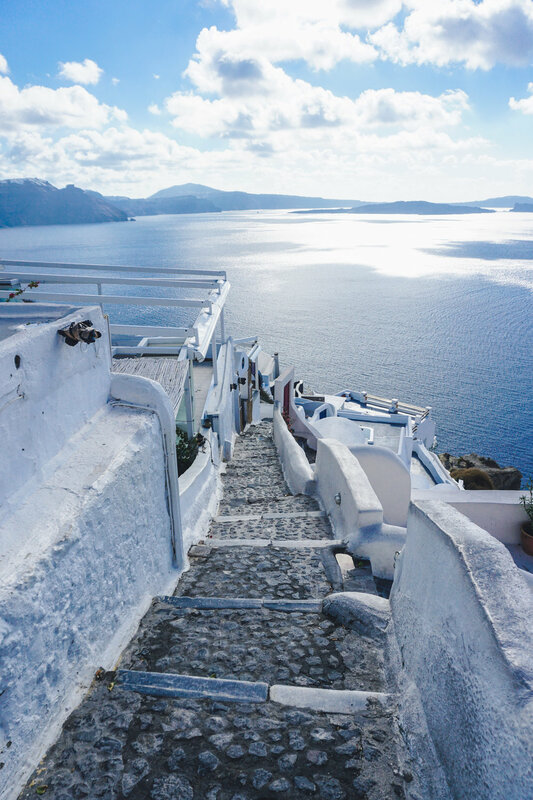 Pro Tip: Do not…we repeat…DO NOT purchase one way tickets to Santorini from Athens and plan on purchasing flights back last minute if you’re trying to save. Jim experimented with this and ended up paying over $100 USD just to get back to Athens. This was all trial and error to see what was possible, and it totally backfired! Santorini Volcano - A day trip you'll never forget as it takes you through the deep blue sea with scenery that can never be unseen. The boat makes two stops, first to visit the volcano’s caldera and then to swim in the "hot springs"…We use ““ for the fact that it’s offered to us as hot, but due to the fact that it’s offseason and it’s cold outside, you take the plunge off the boat into cold water to swim to the warmth. After you become a bit cozy in the warm spots, you then have to swim back through the now colder water to board the boat yet again. If you’re looking for something that’s stronger than a double shot of espresso to wake you up then this is your big moment! Pro Tip: This is not for the faint-hearted. It's a whopping 596 steps to go down to the port to catch this boat and the same on the way back up. I planned on taking the cable car up and down, but it was not possible due to high winds. We also do not believe in the culture behind whipping a donkey and having it carry me up and down the mountainside. Cost $25 USD for the 3 hours. Self-guided ATV tour - Work your way down through the southern part of the island where you'll be able to see red, white, and black sand beaches. Afterwards, head back up the east side of the island and loop back to Oia to get the best view of the sunset available on the island. It will take you all of about one hour to get to the south, and about two and half hours to do the Island as a whole. 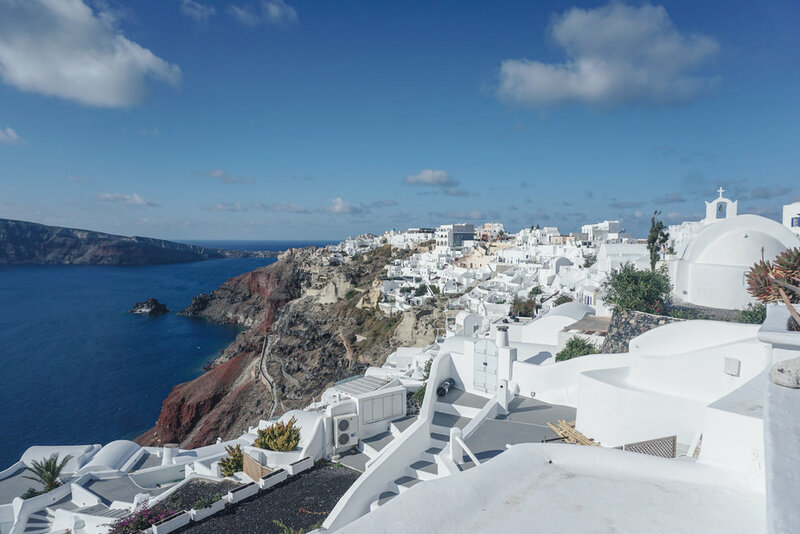 Hike from Fira to Oia - If you want to work off those Greek beers and gyros you've been ingesting, and are looking for the perfect Instagram photo, then this hike is for you. It takes about 2 1/2 hours to complete one-way, so plan accordingly so you can catch that sunset. Oh yeah, and I almost forgot...it's FREE! This is by far the most photogenic thing you can do on the island, you’ll find yourself a year later going through your photo reel using the same hike in all your Instagram photos! Rent an ATV - This will allow you to see the Island in its entirety and give you the freedom to find restaurants that are a bit cheaper and off the beaten path (the local favorites!). Only a valid driver’s license is required. Stay in a budget hotel - I found this to not only be a great way to save money, but an amazing way to meet other solo travelers when on an almost "couple island"! Honestly was the highlight of my entire time on the island. Rent a Scooter - This can be a bit tricky and confusing for some, as you do need to have an international motorcycle license to rent one. You just need to be less of a shy person and not afraid to ask if they’ll rent one to you, just like anywhere else in the world cash is king. If you aren’t certain that a place will rent to you for some reason, leaving a cash deposit until you return with the undamaged bike as a collateral should be fine. Buy Groceries - I know it sounds simple, but this one alone can make or break your trip. The grocery stores close by offer everything you need from meats, cheeses, pasta, beer, and cheap liquor. Book Flights in Advance - Don't wait until the week of to book your flights back to Athens. By doing that you're likely to pay double the price of your initial flight. During the off-season, a one-way flight should cost you around $40-$50 depending on the time. Fly Smart - If you're flying from the United States, do not look up flights to Santorini. You want to look up flights to Athens, and from there you can take the cheap flight to Santorini. Otherwise, you'll end up spending a fortune to fly to Santorini, and it will still not be a direct flight. Visit During Off-Season - Sure it's not going to be the weather you've always dreamed of, and it may not allow you to do everything you wanted. But it will save you money, allow you to see more, avoid the crowds, and definitely allow for a more relaxing environment. Thinking about visiting Athens as well, but on a time crunch? Seeing Athens in 72 hours is possible, if done properly! I stayed in three different places while in Santorini - one cheap, one mid-range, and one expensive. While all three offered completely different experiences, the one that left the best taste in my mouth was the cheap one. Budget - Hotel Villa Manos. For $30 USD during the off-season, I was able to stay at this wonderful property located about 20-30 minute walk from the middle of everything. Here you form a sense of community/family with the owners and staff who make you feel like you’ve been living there your entire life…not only that, but this is the true way to see Santorini on a budget…aside from finding a place on Couchsurfing that is. Mid Range - Calderas Majesty Aside from the ownership and staff taking this place to the top of the list, you’ll find everything to be just as described on every booking site. This perfect mid range hotel will set you back just over $100 a night and will also get you a hot tub facing the sunset! Not a bad deal if we say so ourselves. Luxury - Dreams Luxury Suites. For over $400 a night this wonderful two story palace can be yours. it includes an infinity pool and hot tub just for you, and you get to take in the sunset of a lifetime that you’ll never forget. Besides the price, the question is in what town to choose for your Santorini vacation? ﻿Renting an ATV is only necessary for the one day, which is enough to see the entire island. Browsing around or booking from the hotel you'll be able to find prices as low as $20-$25 USD for a 24hr rental. Other days stick to walking or taking the bus, which runs the length of the island and will cost you $2. If you plan on eating out, you'll be left with quite a few options on cheap eats. I managed to find several restaurants in the heart of Thira where you can have Mussels for $12, stuffed mushrooms for $9, and if you’re looking to have a drink at dinner remember that wine is cheaper than beer in Greece. As stated earlier, the best way to save some money so you can splurge on a nice dinner is to grab a few meals from the local grocery store. There are so many wonderful restaurants of all shapes and sizes, please do not get held up on prices. This island has cuisines built for every type of traveler and every single type of budget, if you’re uncertain of where you fit in, do yourself a favor and just ask someone! Budget - Lucky’s Souvlaki. If you’re looking to eat like a local and pay the right price then you head to no other place than Lucky’s! For under $5 you’ll find yourself chomping down on one of the best gyros you’ve ever had, an order of french fries, and a soda. I managed to eat here several times during my trip, and you’ll see lots of people splitting one order due to its size. Mid Range - Pelican Kipos. One of the best outdoor seating areas you’ll find on the island, and an unbeatable price. Here you’ll find every type of seafood that’s available, large wine list, and decor that’ll make you feel right at home. The waitstaff here go above and beyond to make sure everything is to your liking, and have no problems making good recommendations based off of your taste. Luxurious - Lauda Restaurant. If you want the perfect sunset dinner cliffside with a nice ambience, amazing food, and one of the most luxurious evenings you can have while in Santorini. Luxury comes with a price though, if you’re looking for that one night to splurge $100 per person then this is the place to do so. Be sure to make a table reservation online! 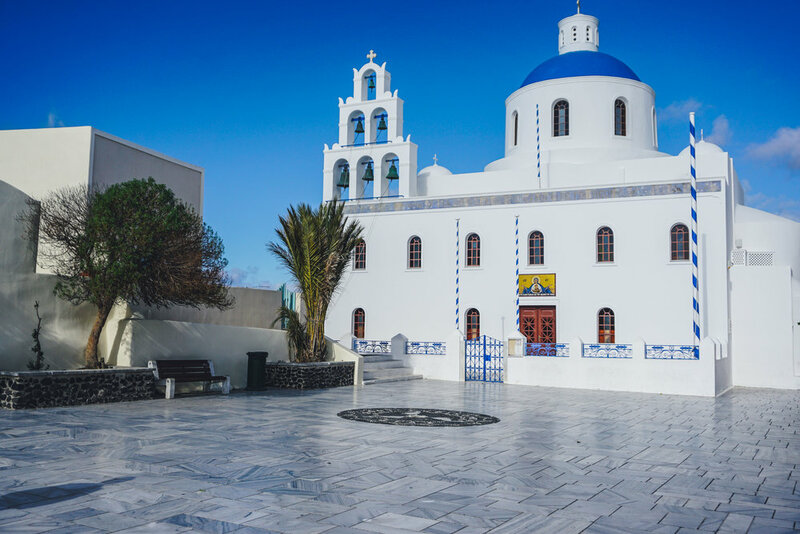 Wondering about Santorini budget during off-season? We got you covered! Looking how to travel affordably to other destinations too? We prepared some tips and tricks for you! Europe a bit out of your price range? Maybe Southeast Asia is for you!